Do you think you have what it takes to survive the Lilypad Adventure? Our full day trip down the undisturbed river will have you basking in wildlife, blue skies & memories that will last a lifetime! Do you think you have what it takes to survive the Lilypad Adventure? If so then our full day kayak/canoe trip is the trip for you! The full day adventure will take you on a trip that you will never forget. You will launch your kayak or canoe right behind Lilypad Adventures for a trip that lasts 5-7 hours long. This of course all depends on how you choose to spend your time on the water. As your cast of the banks of Lilypad Adventures you will start your trip down a path filled with mossy trees lining your way. Then just as you past the river bend, the water becomes crystal blue where you can spot the fish swimming below your feet. Your trip will have several points where you can stop and enjoy lunch or take a break and explore your surroundings. Following paths that take you right through the center of an undisturbed Mother Nature, you are sure to find an adventure like no other. Wildlife can be found on every corner, rather it be turtles basking in the sunlight or birds nesting in fallen tree trunks . We have set scheduled pick up times at the end of your trip, so enjoy your leisurely stroll by taking photos, fishing, bird watching, having a picnic on the bank or even jumping into the water to cool off. How you spend your time is totally up to you! 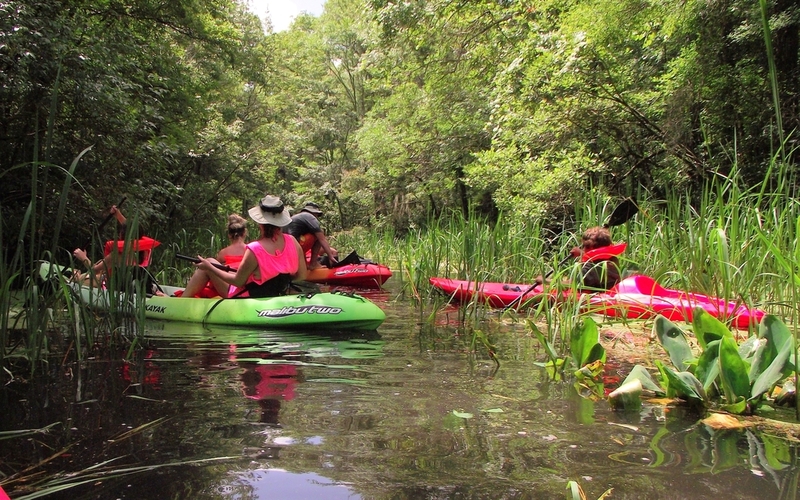 Here at Lilypad Adventures, we offer three different kinds of transportation down the river including: tandem (one person) kayaks, two person kayaks orcanoes that can fit up to three people. If you are just starting off or have a younger child with you, we would suggest starting off with a canoe, which is easier to navigate through the waters. Are you a little more skilled and looking for solitude with Mother Nature, if so then our one seater kayak is the perfect fit. As always feel free to enjoy some recreational sports while you float down the river. We do allow fishing from our kayaks & canoes, so be sure to bring your poles and lures with you. There are spots on the bank for your family to swim or have lunch. Don't worry if you get to Lilypad Adventures and realize that you have forgotten something. We have a general store on site that has everything you could ever think of including: ice for your coolers, cameras, flip-flops, sunscreen and even dry bags for your cell phones. You can rest easy knowing that we are here to make sure that your adventure is one that you will remember for a lifetime.